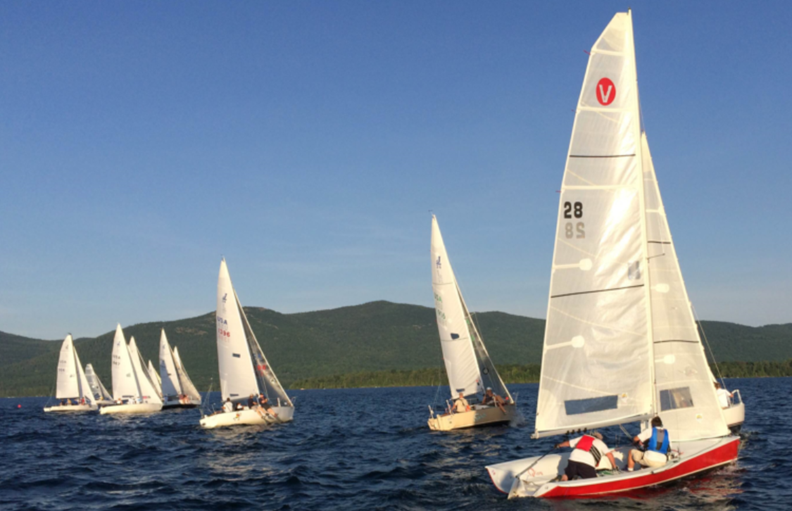 The competitors were treated to another beautiful night on Lake George with SSE winds at 8–10 at the start. A four-leg course was chosen using North Canoe as the first windward mark, the pin end of the start line as the second (leeward) mark and then a long leg to the Diamond Island government mark followed by the downwind leg to finish. Thanks to Deb Katz helping with RC duties! John Tarrant was competing single-handed in the new VX1 and showed remarkable speed on the start line. Spirit and Brad’s J/80 had great starts at the committee boat end of the line. Uncle Ludwig barely had enough room left at the pin end but everyone got away cleanly and the sprint was on to the first mark. Witch Way and Spirit had a private battle during the first upwind. Brad, unmolested on the west side of the course, made it to the mark first, followed by Uncle Ludwig and Animal. With an uncharacteristic hourglass, Witch Way lost some ground to the ever-present Spirit and both boats established a nice rhythm down to the second mark. The first two legs were sailed in about 15 minutes which was slower than the RC had expected. As the fleet was rounding the second mark, Cut Loose, being sailed single-handed by John Dickinson, started the race. As the fleet sailed upwind to Diamond Island the wind slowed and there were hints of holes appearing to the south and west of the course. With the wind velocity and sun dropping the RC raced the fleet up to the mark and saw Brad leading the fleet with Witch Way and Windog in competitive positions based on time allowance. John T’s new VX1 had a good showing even though limited to one person and no spinnaker! At the turn the RC signaled a change of course to an orange ball set just to the southwest of Speaker Heck. With the assurance that the fleet had been notified, the RC boat raced back up the lake to drop anchor for the finish. During the last leg, the wind stayed in a nice band straight down the course but was fading to the west. Vaporize, after a tough time on the upwind leg, finally chased down the VX1 in the wind band while Animal, Uncle Ludwig and Spirit watched their spinnakers collapse on the west side of the course. Spirit was able to gybe back out into the wind earlier than the other two boats. Brad led the way to the finish with Witch Way and Wild Thing making good time down the middle a few minutes behind. Windog, also sailing down the middle, was able to capture fourth across the line and third for the night, ahead of the unfortunate west side pack of J/24s. Congratulations to Alfie Merchant and crew for capturing another win, with Brad taking second for the night. Next week’s race will be a little less ambitious than last evening, to accommodate both a race and then the celebration at Carl R’s Café at Exit 18 of the Northway. The 2016 sailing series awards will be given to the top four boats. The Jeff Underhill Trophy will be awarded to our series winner. As added incentive to attend, if that’s really needed, a random drawing will award some Gill merchandise to some lucky crew members among the eligible boats.